The Graco spray gun 224-472 was designed for mastic and emulsion roofing applications – Rated for 4,050 PSI to push production without sacrificing the quality of your results, this mastic gun is an industry favorite. The 36 inch length of the wand is comfortable and convenient particularly for large applications, reducing bending and fatigue and increasing the user’s comfort during the application process. The unique T- Handle grip shifts the weight away from the user’s arm and hand, and the inline valve both work towards increasing production and comfort. The fast on and off capabilities, thanks to the pistol grip, add to the superior performance and design. The performance seen with a mastic application is areas above your head or in recessed, hard to reach spots is maximized with the Graco Mastic gun. 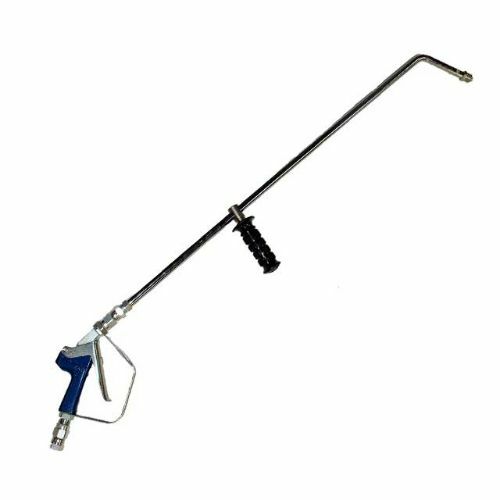 The full length needle is also unique to this spray gun, providing a shut off for fluid flow at the tip – providing a crisper spray pattern that reduces spatter, spitting and waiting. Keep your jobs on track and on schedule in the final stages, and ensuring that the important application process for a mastic coating goes off without a hitch. Having the Graco 224-472 sprayer for mastic coatings provides a more comfortable operation, while also maximizing the consistency and ultimately promoting a great end result. Order the Graco 224-472 Mastic gun online and see the impact from the very first day it hits your job site. Shop all roofing equipment, for mastic, spray foam and more – with Cleasby Roofing Equipment and Graco at Intech Equipment and Supply. Trust your work sites to the best in equipment and service and focus on the important aspects of your business growth and prosperity. Call us today for additional information including custom ordering or equipment compatibility. Keep your jobs on schedule and speaking volumes about your business!